Why we love it: Formulated with deeply nourishing, moisturizing and anti-aging plant ingredients, this rich body cream intensely hydrates and rejuvenates the appearance and texture of the skin. Omega-rich African Marula oil penetrates the skin with skin refining and refreshing fatty acids, creating a firmer, more elastic tone. Alpine Rose Plant Stem Cells have demonstrated ability to repair and delay signs of aging while Kalahari Melon Seed and Baobab oils enhance the vibrancy of the complexion. Generously apply all over body for hydrated, healthier skin. 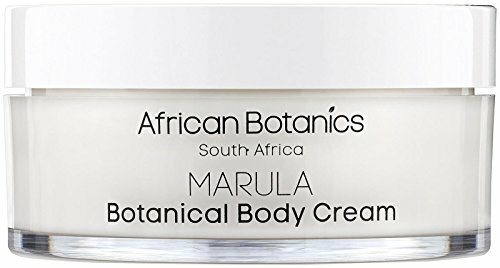 Aqua (Water), Glycerin, Sclerocarya Birrea (Marula) Seed Oil**, Glyceryl Stearate, Cetearyl Alcohol, Glyceryl Caprylate, Butyrospermum Parkii (Shea) Butter, Cetyl Alcohol, Cetostearyl Alcohol, Sodium Stearoyl Lactylate, Rhododendron Ferrugineum (Alpine Rose) Leaf Cell Culture Extract, Isomalt, Sodium Benzoate, Lactic Acid, Adansonia Digitata (Baobab) Seed Oil, Citrullus Lanatus (Kalahari Watermelon) Seed Oil, Myrothamnus Flabellifolius (Resurrection Plant) Extract, Lecithin, Capric/Caprylic Triglyceride, Ubiquinone (CoEnzyme Q10), Alcohol, Glyceryl Caprylate, Citrus Paradisi (Grapefruit) Essential Oil, Asparlathus Linearis (Green Rooibos) Extract, Tocopherol Acetate, Vanilla Planifolia (Vanilla) Extract, Xanthan Gum, Sodium Phytate, P-Anisic Acid, Citric Acid, Citral*, Limonene*, Linalool*. *Constituents of natural essential oils used. ** Organic.